Home / News / “Lightning Gave Me Abs?” A Longer Trailer For The Flash Is Here! The CW today released a longer trailer to promote The Flash, which premieres this Fall on the network and stars Grant Gustin in the lead role. Of course, if you’re on this website you already knew that. Here’s the new trailer, and we’ll get some screen captures up soon. We’ll replace this with a YouTube version soon, too. The Flash will air Tuesdays at 8PM on The CW, right before Supernatural, and in case you missed the news… Arrow’s Stephen Amell will be in the pilot as Oliver Queen! 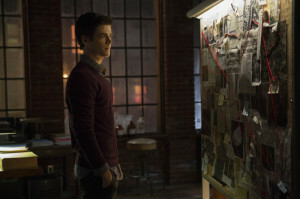 Previous: New Official Images From The Flash Pilot! Is anyone bothered by the fact that the music in the 30 second promo sorta sounds like the score from 2003 Spiderman? I’m not really bothered by it, but it just seemed odd to me. Grant Gustin even sounds a little like Tobey Maguire when he’s monolouging. Is it just me, or does this look better than Gotham, and possibly even better than Arrow? Awesome. Weather Wizard, right out of the gate. And John Wesley Shipp as Barry’s father. This show already looks like a winner. “Hit the bench Oliie, there’s a new kid in town. My name is Barry Allen, and i am the fastest man alive. A friend recently gave me the idea for a new name, and something tells me, it’s gonna catch on”.